Enjoy a good laugh and a little toilet humor. 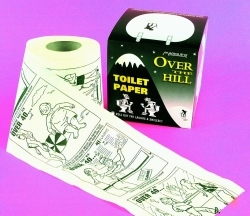 Listen to granddad’s shout of pleasure and laughter with this Over the Hill Toilet Roll that has classic comics written on both the box and the paper. A great gift for those who love to laugh and welcome humor once in a while.